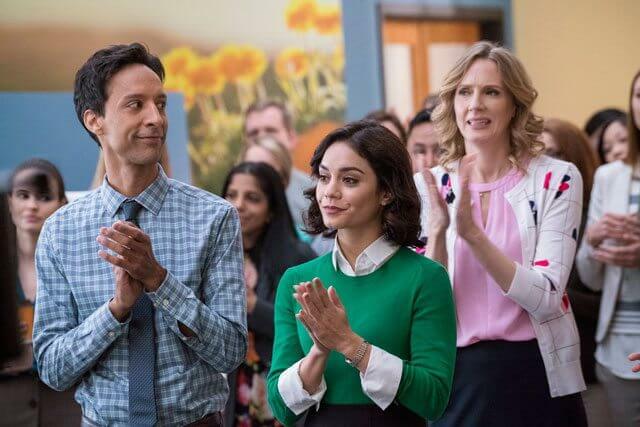 Danny Pudi called upon his real life work in insurance prior to landing a role on Community for his character in NBC’s new series, Powerless. The half-hour comedy is set in a world in which superheroes are accepted as the norm, and Pudi’s character Teddy has to deal with insurance claims caused by the damage done during superhero rescues and fights. The series, which is the first comedy involving the DC Comics universe, is slotted as a midseason replacement and also stars Vanessa Hudgens, Alan Tudyk, Christina Kirk, and Ron Funches. During the 2016 San Diego Comic Con, the cast not only took part in a Q&A about the series but also sat down for roundtable interviews to further discuss the world of Powerless. Where do you get to go with this role as opposed to other roles you’ve played? Were there a lot of comedic opportunities with that sort of insurance? It seems like a world where Abed would have been right at home. What did you have to do to distinguish Teddy from Abed? How does he view the world that he lives in with these superheroes?